COD18-45: 50.1 g/t gold and 375 g/t silver over 2.05 meters. COD18-46: 54.9 g/t gold and 379 g/t silver over 1.47 meters. COD18-63: 28.0 g/t gold and 424 g/t silver over 1.17 meter core length. 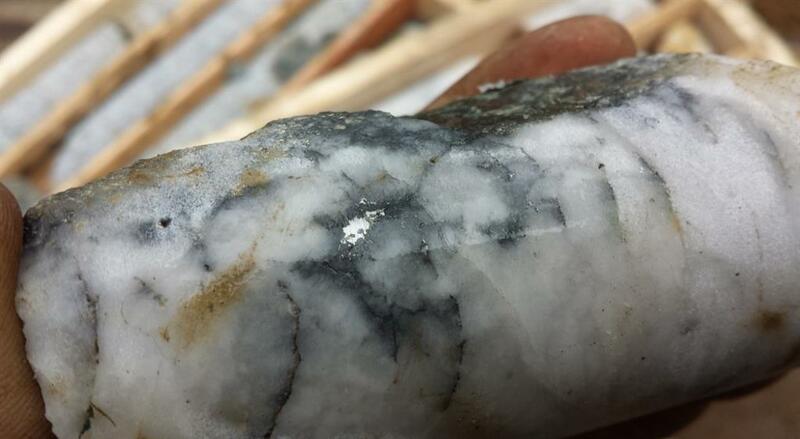 Gold and silver bearing quartz veins in multiple regions of the property with high grade gold reported (samples exceeding 1 oz. / ton gold reported). 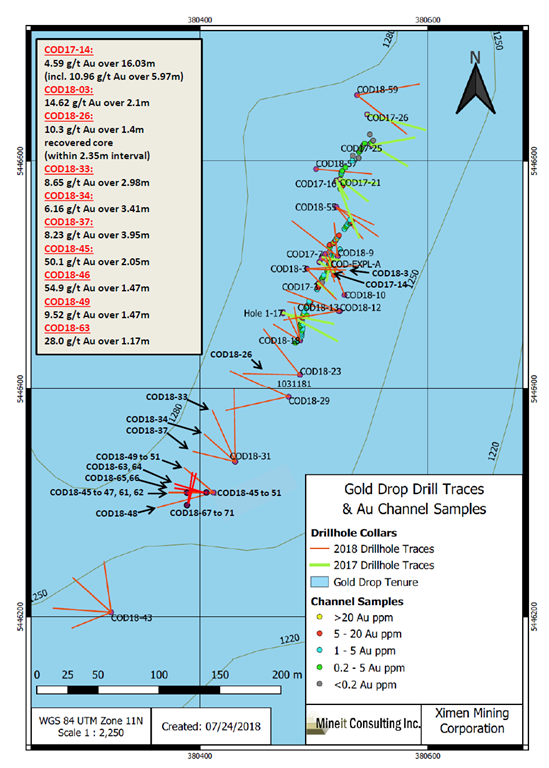 Historic gold and silver production at the Gold Drop, North Star, Amandy and Roderick Dhu vein systems. The 2018 Fall diamond drilling program tested the COD vein, located in the Gold Drop Southwest Zone. The program followed up on results from earlier 2018 diamond drilling at the southern extension of the COD vein. Two earlier 2018 holes at the southern extension, COD18-45 and COD18-46 (which were drilled at 45 and 50 degree dips to the west from the same site), intersected high grade gold and silver plus significant amounts of tellurium. COD18-45 intersected of 50.1 grams per tonne (g/t) gold and 375 g/t silver over 2.05 meter core length including 167.5 g/t gold, 1,370 g/t silver and >500 g/t tellurium over 0.46 meter core length (News Release of August 15, 2018). COD18-46 intersected 54.9 g/t gold and 379 g/t silver over a 1.47 meter core length, including 223 g/t gold, 1,535 g/t silver and greater than 500 g/t tellurium over a 0.30 meter core length (News Release of August 22, 2018). Intersections exceeding 1 g/t gold for drill holes COD18-61 to COD18-64 are listed in the table below. Since true widths cannot be accurately determined from the information available the core lengths (meters) are reported. Quartz veins & altered wall rock. All of the 2018 Fall drill holes were collared within 25 meters of holes COD18-45 and COD-46. Holes COD18-61 to COD18-66 were drilled to the west and slightly northwest at dips of 45 to 60 degrees to intersect the approximately northeast striking COD vein. Holes COD18-67 to COD18-71 were drilled at dips of 45 to 60 degrees slightly northeast to intersect the COD vein at a shallower angle, the purpose being to test the continuity of the quartz veining and mineralization. The high grade intercept of drill hole COD18-63 is at approximate 20 meter vertical depth (similar depth of high grade intercept of drill hole COD18-45) and approximately 5 meters north of the high grade intercept of drill hole COD18-45. The COD vein system is open to the northeast and at depth and possible open to the southwest. 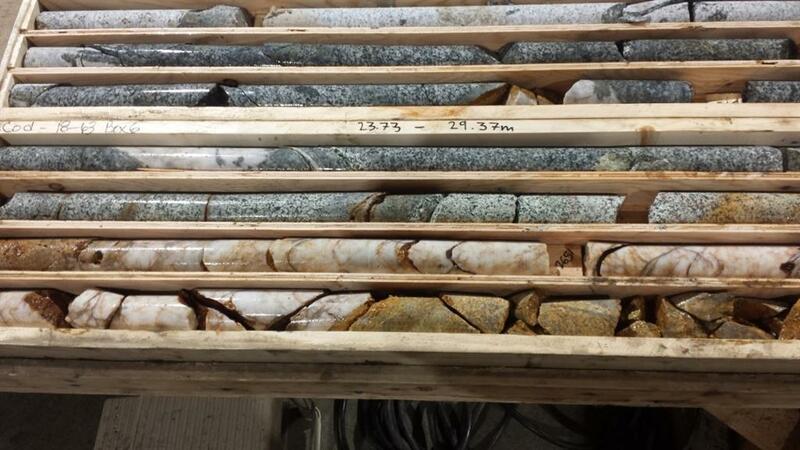 The drill core was split at a secure location in Greenwood with half core samples securely packaged and delivered to ALS Canada Ltd. in Vancouver, BC for preparation and analysis. The core samples were analyzed for gold by Fire Assay-AA and for 48 elements (including silver and tellurium) by Four Acid - ICP-MS. Samples exceeding 100 g/t silver were re-analyzed for silver by Four Acid - ICP-AES. Quality control (QC) samples were inserted at regular intervals.
" We don't have to do this, we get to do this "